Social Forum Journey » December 16 more non-violent than December 12? December 16 more non-violent than December 12? One thing is for sure. Some organisers of the broad climate demonstration on December 12 as representatives of Climate Action in Sweden tries to claim that they are doing a good non-violent manifestation while Climate Justice Action on December 16 is doing something more violent. Now it is clear. They do not know what they talk about. This became evident in the last week. 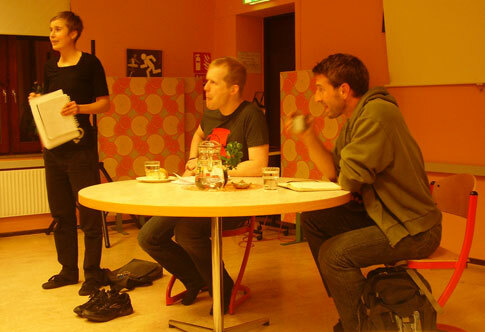 At a meeting with some 70 activists in Malmö organised by Friends of the Earth and Attac Tadzio Müller from Climate Justice Action and Andreas Malm from the December 12 initiative had a discussion on actions during the Copenhagen summit. Malm strongly advocated broad demonstrations as the one on December 12 while he saw direct actions against the COP meeting as contra productive. 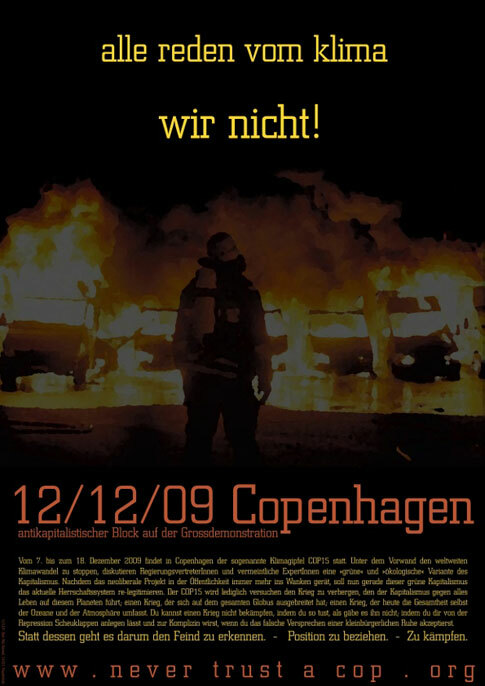 Also in Denmark confrontative non-violent action at the Bella center have by some been seen as only resulting in violence and the demonstration on December 12 presented as an alternative. The whole concept of the December 12 initiative is to be broad and rather a platform for many different messages than a joint manifestation. This means that there is less common political commitment and quite contradictory messaging. Malm as a representative of December 12 initiative in Malmö claims that the risk that the demonstration will be coopted by the establishment is minimal and that the platform opposes market mechanisms as a solution to climate change. In Copenhagen Oxfam have taken over the production of the leaflet for the demonstration. The result is a chocking pink paper with a text in yellow and white stating ”Planet first! People first!” and then ”family-friendly climate-demonstration”. Furthermore the texts reads ”It is now something happens”, ”the future of the planet will be decided”, ”the watch is ticking” – all part of the big NGO tcktcktck campaign rhetoric for COP15. 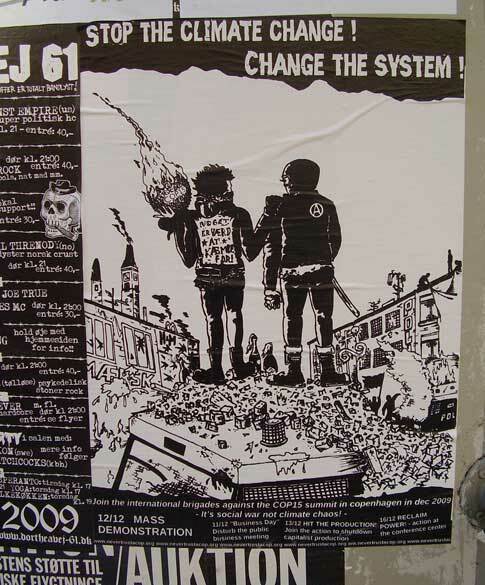 The leaflet claim that the leaders of the world have the power to change the course of history in Copenhagen. If we are many enough, that demands action they cannot ignore us. It ends by saying join a peaceful and colourful Global Climate Action Day in Copenhagen. It is hard to make a leaflet less political or more devote in its approval in advance of whatever the politicians decide. On the back page is the official platform and the list of organisations supporting the initiative. The proposal from Oxfam had been happily received by all. 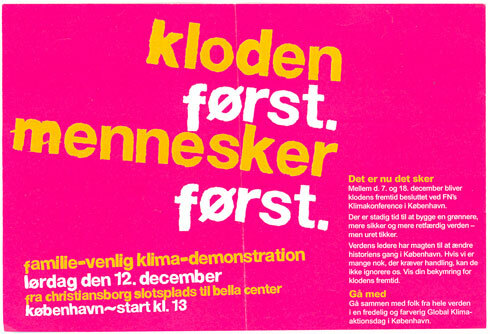 While this shocking pink leaflet talks about a family-friendly, popular and colourful global climate action day in Copenhagen other posters for the same demonstration states something different. It is hard to believe but while CJA since a long time consciously tries to avoid messaging confrontation with police as a main purpose of their actions and keep groups away that do so the organisers of December 12 are not aware of that it is their demonstration that is presented in this way. In Denmark and internationally mobilisation with images that makes a clear message directly contrary to what the shocking pink leaflet states are distributed. Not even the posters that are put on the walls in Copenhagen have reached the eyes of some organisers although they are evident. The Danish text on the back of the left activist states “Something is worth fighting for”. Also is it easy to find similar propaganda material about the December 12 demonstration internationally. The German text in the title reads: Everyone talks abou the climate, We not! So both claims about the December 12 demonstration are questionable. Firstly the claim that it has a clear platform which is confrontational to that of established NGOs and rich countries promoting market mechanisms. So is the claim that December 12 is non-violent and what CJA is up to is causing violent confrontations. It must be stated that Danish organisers at least now is less into polarisation against CJA. What one can hope for is more of finding common interest in acting against repression and politicizing with different tactics the different forms of activities taking place in December. One good step in that direction is the creation of a climate justice block in the demonstration with the main message: ”System change – not climate change” jointly organised by Climate Justice Now and Climate Justice Action. Here everyone that wants a clear message can join together with the social movements that are part of CJN. In this way the December 12 demonstration could be a way for different actors to come together bringing both those committed to system change and those that more in general are concerned about climate change.